This durable light case from Blackhawk is designed to fit the Surefire 6P and Streamlight TL-1, Scorpion and Strion flashlights. 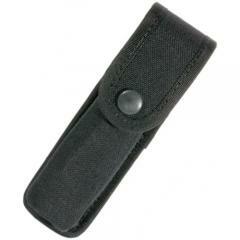 It is made from a non-molded Cordura nylon laminate, making it wear-resistant and easy to care for. Its four-layer laminate construction includes a layer of waterproof closed cell foam for impact protection, as well as a flexible polymer reinforcement layer that preserves the pouch's shape and a knit liner that won't scratch the light's finish. Its top flap provides greater coverage and protection, and comes with a no-glare metal snap that fastens it securely while providing easy access. What are the measurements of this holder? ?